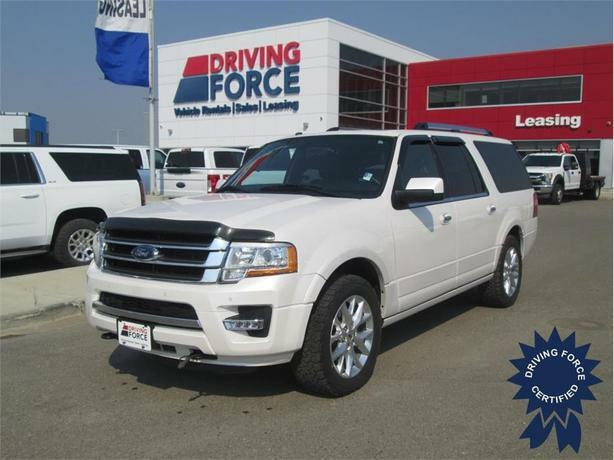 This 2017 Ford Expedition Max Limited 8 Passenger 4X4 SUV has a 6-speed automatic transmission with SelectShift, heated/cool perforated leather bucket seats, rear load-levelling mechanical suspension system, all-weather floor mats, Blind Spot Information System (BLIS), limited slip 3.73 rear-axle ratio, block heater, 200-amp alternator, Class V towing with harness, hitch, and trailer sway control, gas-pressurized shock absorbers, front and rear anti-roll bars, electric power-assist speed-sensing steering, 129-litre fuel tank, 1600# Maximum Payload and GVWR rating of 7,760 lbs (3,520 kgs). The 3.5-litre Ecoboost V6 gas engine offers 365 horsepower at 5000 RPM and 420 lb-ft of torque at 2250 RPM. Email us for more information about this ride.